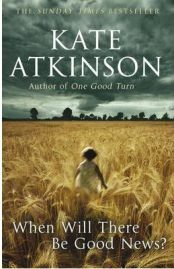 “When Will There be Good News?” is the third of Kate Atkinson’s crime novels featuring Jackson Brodie, and picks up a couple of years after One Good Turn. Quite a bit has happened in Brodie’s life in the intervening period, and also in the life of Detective Chief Inspector Louise Monroe, who was introduced in One Good Turn and is one of the major characters in “When Will There be Good News?” Kate Atkinson is very skilled at drip feeding the back stories of her characters throughout her book – at the end a complete picture has emerged, explaining how and why certain earlier events have happened. There are certainly plenty of unexpected developments here, right until the last chapter, and the plot is of the highest quality. Several plot strands run throughout the book. A terrible crime in Devon thirty years previously is witnessed by a six year old girl. In the present day in Edinburgh, a precocious sixteen year girl (Reggie) does her best to cope with terrible family circumstances and a series of disasters which engulf her. Meanwhile, her General Practitioner employer disappears with her young baby, and Reggie seems to be the only person who is at all concerned. Jackson Brodie catches a train northwards to Edinburgh and Louise Monroe is hunting for another missing person while struggling with the demands of work and home life. Gradually all of these strands converge and we see the linkages between them, though the ways in which they resolve are still unexpected. Many terrible things happen to the characters in “When Will There be Good News?” Yet they are a resilient bunch, and Atkinson seems to be paying tribute to the capacity of people to bounce back and persist in the face of adversity. We might expect this a little from Jackson Brodie based on our knowledge of him from the previous books, but it is even more true of some of the other central characters – particularly Reggie and her GP employer. Reggie in particular is a very attractive and entertaining character. Even when the book is at its darkest, she retains her positive outlook and attitude. I hope that maybe she will return in future novels in the series. Ironically, it is Louise Monroe who seems to be struggling most with her life, despite her personal circumstances having taken a turn for the better. Certainly, in this novel things which appear to be good news do not necessarily bring happiness, and bad news may give rise to good outcomes. Kate Atkinson is writing at a very high standard – the Jackson Brodie series is some of the very best crime fiction being produced today. These books are best sellers and deserve to be – highly recommended. No Comments on "When Will There be Good News?"